The Trail Camera from Bushnell is designed to get the perfect shot at hunting trails. It has a 14.0-megapixel camera that will enable its users to capture high-quality and full-color resolution images, and it can also get High Definition Videos too. The camera has 48 No-glow black LED’s that has a range of 60 ft. So whether you are capturing your game in the day or the night, it will not run away. It also has a day and night auto sensor and a field scan with two available time slots so you can monitor both dusk and dawn movements. This camera has lightning fast trigger speed, and it can also capture multiple photos per trigger. The video length of the cam can also be customized to your preference. This camera is ideal for those who want to customize the settings to their preferences. From the trigger speed to video length almost every feature is programmable. You can program the trigger interval to have a 1-second split or even an up to an hour split. The multi-image mode can also capture one up to three images per trigger, and the video length can last up to 60 seconds. The Bushnell Trophy Cam also has its SD card slot so you can store as much image and videos as you want, but if you want to transfer the photos and videos directly to your phone or laptop, you do not need to use any USB wires because it can automatically move the images to the cloud. The camera is very easy to setup and you are given affordable pre-paid data plans from Bushnell. The camera works great in capturing both images and videos, and in most cases, the camera will send the pictures within a minute of taking it. The quality of the photos are excellent even the thumbnails look very clear and decent. Another feature of this trail camera is that it has a wireless connection and you can use its app that will enable you to send photos online. The batteries can also last up to 3 months, and you can also use the camera for other reasons such as taking surveillance and security videos. The camera also has a hyper night vision feature so even if it is after dark you can still capture share images and videos. According to some users that have previously tried this trail camera highly, they rate it highly due to its flexibility and because it can produce high-quality photos. Users find this camera great because of its easy setup, and it can connect online, this camera has a free app which you can download online, and you can also change the settings on the camera remotely. The camera also has GPS that can pinpoint exact locations or if not just inches within the exact location. Another feature that the owners of this camera love are that it is weatherproof. It can handle temperatures that range from -5° F to 140° F.
Though some user praises this trail camera highly, there are also some users that have bad experiences with this trail camera or have a few suggestions that might make this camera work better. The camera’s inability to connect an external antenna is one of those, and then you are out of luck. The video length of the camera can only last up to 60 seconds, and some users say that the camera will lag and sometimes take extended periods of time before being able to send the photos on the cloud. Some users have suggested through a time block when the unit would not take any pictures feature would be nice so you will not see any useless photos in times when you don’t want to. 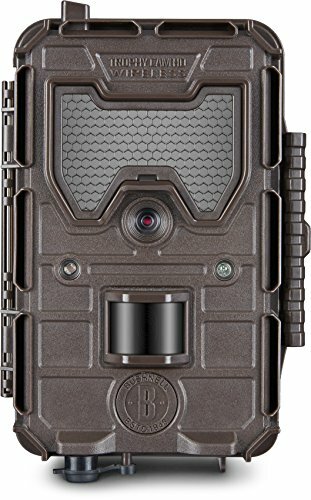 Like all other gadgets and trailer cameras, this game camera from Bushnell also has its pros and cons; it has got unique features and benefits. This camera is great if you are looking for a trail camera that will produce high-quality photos and videos and if you are looking for something you can customize to your preferences. However, if you live in an area that doesn’t have a great signal then it is advisable you don’t choose this camera because of its lack of an antenna plug. This camera will last for a long time but don’t cheap out on the batteries. Instead of buying regular batteries opt for good lithium batteries and your camera’s life will last longer and it will operate much better.